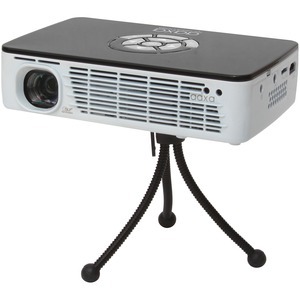 The AAXA Technologies P300 DLP projector is the world's brightest battery-powered HD pocket projector. The 300 lumen brightness and the WXGA resolution provide excellent detail and clarity, even in less than optimal lighting conditions. The compact size makes it perfect for mobile professionals always on the go. With a lamp life of up to 15,000 hours, the AAXA Technologies Pico P300 provides excellent value.